I know mid-January is a little overdue for a winter coat post, but for those men still on the hunt for a good-looking coat, go for the toggles. It's likely you already have the standard men's coats: the warm (but never really warm enough) North Face jacket, the pea coat for fancy occasions, and the ski jacket if you like to hit the slopes from December-March. 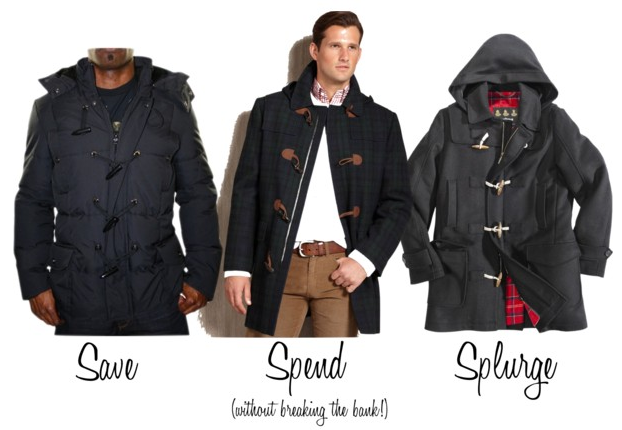 The toggle coat is a nice alternative to all of these, and its added flair along the front gives it dress-down appeal. Bonus: Most of the toggle coats have hoods! I scoped out a few, which can be seen below (feel free to save, spend or splurge), but I also loved this one and this one as well. Haha didn't know they were so menswear! I just bought a women's toggle coat for myself and adore it :) Love your picks! I love Toggle coats for men. I have one of this.. on blue, it's fantastic!